A breeding resident throughout most of the wooded portion of the state. Breeds in southern Sierra Nevada foothills, New York Mts., Owens Valley, and other local areas in southern California. Ranges from sea level to above 2700 m (0-9000 ft). Dense stands of live oak, riparian deciduous, or other forest habitats near water used most frequently. Feeding: Catches small birds, especially young during nesting season, and small mammals; also takes reptiles and amphibians. Hunts in broken woodland and habitat edges; catches prey in air, on ground, and in vegetation. Often dashes suddenly from perch in dense cover and pursues prey in air through branches. Sometimes runs prey down in dense thickets. Uses cover to hide, attack, and approach prey; also soars and makes low, gliding search flights. Cover: Seldom found in areas without dense tree stands, or patchy woodland habitat. Reproduction: Nests in deciduous trees in crotches 3-23 m (10-80 ft), but usually 6-15 m (20-50 ft), above the ground. Also nests in conifers on horizontal branches, in the main crotch, often just below the lowest live limbs. Nest is a stick platform lined with bark. Usually nests in second-growth conifer stands, or in deciduous riparian areas, usually near streams. Water: Nesting and foraging usually occur near open water or riparian vegetation. Wetting or drowning of prey has been described. Pattern: Frequents landscapes where wooded areas occur in patches and groves (Beebe 1974). Often uses patchy woodlands and edges with snags for perching. Dense stands with moderate crown-depths used for nesting. Seasonal Movements/Migration: Mostly a yearlong resident. Some from more northern areas migrate into California; also moves downslope and south from areas of heavy snow in autumn and returns in spring. Home Range: In Michigan, Craighead and Craighead (1956) measured 4 home ranges that averaged 311 ha (768 ac) and varied from 96-401 ha (237-992 ac); they estimated that 17 other home ranges averaged 207 ha (512 ac), and varied from 18-531 ha (45-1312 ac). They reported 1 home range in Wyoming of 205 ha (506 ac). Territory: Males defend an area about 100 m (330 ft) around potential nest sites prior to pair formation (Brown and Amadon 1968). Nests in Oregon were 3.2 to 4.2 km (2 to 2.6 mi) apart (Jackman and Scott 1975). Elsewhere, nests have been reported 1.6 to 2.4 km (1 to 1.5 mi) apart (Meng 1951, Brown and Amadon 1968). Of 77 territories in California, in oak stands, mean distance between nests was 2.6 km (1.6 mi). Reproduction: Breeds March through August; peak activity May through July. Single-brooded; clutch size 2-6, usually 4-5. Female incubates 35-65 days (Brown and Amadon 1968); male provides food during this period. Young altricial; yearly fledgling success is about 2 young/ pair (Craighead and Craighead 1956). Niche: An important predator of small birds. Nestlings and immatures not yet skilled at catching prey may be killed by ravens, northern goshawks, and great horned owls (Beebe 1974). May compete, to a limited extent, with sharp-shinned hawks and northern goshawks. Comments: Breeding numbers reduced in recent decades. Beebe, F. L. 1974. Field studies of the Falconiformes of British Columbia. Brit. Col. Prov. Mus. Occas. Pap. No. 17. 163pp. Bent, A. C. 1937. Life histories of North American birds of prey. Part 1. U.S. Natl. Mus. Bull. 167. 409pp. Brown, L., and D. Amadon. 1968. Eagles, hawks and falcons of the world. 2 Vols. Country Life Books, London. 945pp. Craighead, J. J., and F. C. Craighead, Jr. 1956. Hawks, owls and wildlife. Stackpole Books, Harrisburg, PA. 443pp. Garrett, K., and J. Dunn. 1981. Birds of southern California. Los Angeles Audubon Soc. 408pp. Harrison, C. 1978. A field guide to the nests, eggs and nestlings of north American birds. W. Collins Sons and Co., Cleveland, OH. 416pp. Harrison, C. J. O., ed. 1978. Bird families of the world. Harry N. Abrams, Inc., New York. 264pp. Henny, C. J., and H.M. Wight. 1972. Population ecology and environmental pollution; red-tailed and Coopers hawks Pages 229-249 in U.S. Fish and Wildlife Service. Population ecology in migrating birds. U.S. Dep. Inter., Fish and Wildl. Serv. Res. Rep. No. 2. Tech. Paper No. 2831. Jackman, S. M., and J. M. Scott. 1975. Literature review of twenty three selected forest birds of the Pacific Northwest. U.S. Dep. Agric., For. Serv., Reg. 6, Portland OR. 382pp. Meng, H. K. 1951. 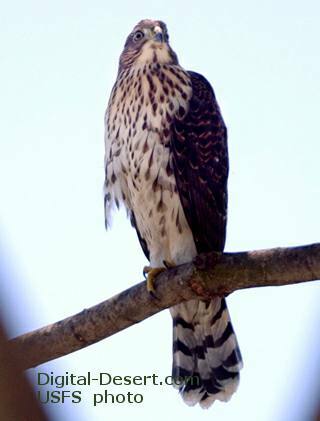 The Cooper's hawk, Accipiter cooperii (Bonaparte). Ph.D. Thesis, Cornell Univ., Ithaca, NY. 202pp. Remsen, J. V., Jr. 1978. Bird species of special concern in California. Calif. Dept. of Fish and Game, Sacramento. Wildl. Manage. Admin. Rep. No. 78-1. 54pp. Reynolds, R. T. 1975. Distribution, density, and productivity of three species of Accipiter hawks in Oregon. M.S. Thesis, Oregon State Univ., Corvallis. 39pp. Udvardy, M. D. F. 1977. The Audubon Society field guide to North American birds: western region. A. Knopf, New York. 855pp. California. Calif. Dep. Fish and Game, Sacramento. Wildl. Manage. Admin. Rep. No. 78-1. 54pp. Smith, D. G., and J. R. Murphy. 1973. Breeding ecology of raptors in the eastern Great Basin of Utah. Brigham Young Univ., Provo. Sci. Bull. Biol. Ser. 18, No. 3. 76pp. Udvardy, M. D. F. 1977. The Audubon Society field guide to North American birds: western region. A. Knopf, New York. 855pp. B116 Life history accounts for species in the California Wildlife Habitat Relationships (CWHR) System were originally published in: Zeiner, D.C., W.F.Laudenslayer, Jr., K.E. Mayer, and M. White, eds. 1988-1990. California's Wildlife. Vol. I-III. California Depart. of Fish and Game, Sacramento, California. Updates are noted in accounts that have been added or edited since original publication.